Oil Can Henry’s – Windsor, CO. 1231 Main Street. Drivers in Colorado’s “Front Range” know what they like. And they clearly like Oil Can Henry’s and our “done right in front of you” service. In fact, readers of Windsor Now! have voted their local Oil Can Henry’s Best Oil Change for an amazing eight years in a row, 2009-2016. 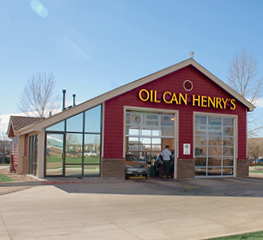 We brought Oil Can Henry’s unique, trusted service to Colorado in 2005 with the opening of our service center at E. 17th Avenue and Pace Street in Longmont (40 miles north of Denver). Encouraged by the enthusiastic reception from local drivers, we opened a second Oil Can Henry’s center on November 28, 2007 in Windsor. Drivers continued to trust their vehicles to our friendly, trained technicians. So, to meet the growing demand, we opened a second Longmont center in 2008, at 17th Avenue and Hover Street. Today, Oil Can Henry’s serves tens of thousands of drivers throughout Colorado’s Front Range, providing quick and convenient service that’s a great value. Congratulations to the tremendous teams of trained technicians at all three Colorado locations. We appreciate your hard work. Thank you all for helping make Oil Can Henry’s “The One You Can Trust”.